SAN YSIDRO, Calif. (KGTV)— November's violent clash between migrants and American border patrol agents temporarily halted businesses in San Ysidro. 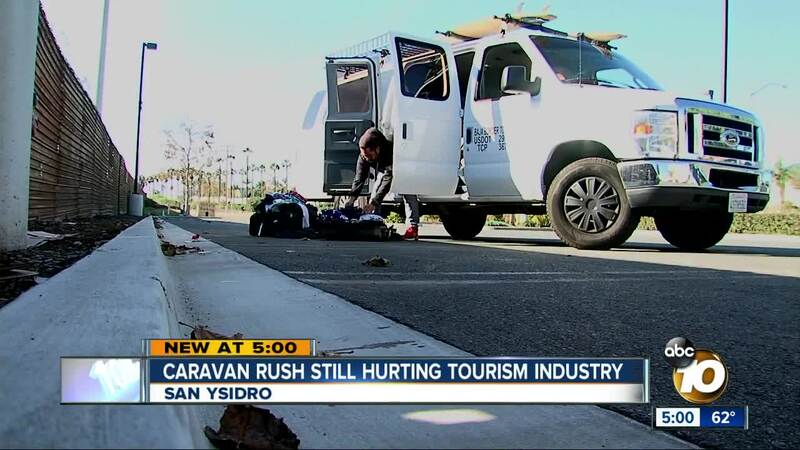 But many are saying it also has lingering effects on the tourism industry, both in San Diego and Tijuana. “It’s killing me. It’s really killing me,” West Barba said. “We go to Ensenada, Rosarito, and Tijuana, and the Guadalupe Valley for wine tasting." After the migrant caravan rush toward San Ysidro, Barba's phones have been ringing off the hook with last-minute cancellations. Barba said his counterparts in Mexico are also feeling the tourism lull. There are several reports of popular tourists areas in Rosarito, looking like ghost towns. Barba had no clients Sunday but still drove his tour van south of the border. “I have a great, great customer named Kathleen, and she put together her neighbors, and we put all the clothes together,” Barba said. Barba's customer inspired him and his family to gather clothes, shoes, and anything else he thought would help the migrants stuck in Tijuana. He put those donations into a suitcase and drove them to the migrant camps. He was struck by the conditions he saw first-hand. “Sleeping on the ground, under those tents. It gets me,” Barba said. Barba is fully aware that the recipients of his donations are the reason for his company’s dismal profits. But at the end of the day, he said his heart wins over his pocketbook. “Even though they are affecting our business, it’s not about ‘We hate you. You guys aren’t helping us. We’re not going to help you.’ No, it’s not like that. We actually want to give back also. Listen, we are all humans. We need to help each other,” he said. Barba is a proud U.S. citizen. He became one after he and his American wife escaped dangerous conditions in Colombia decades ago. Barba said he is sympathetic of the migrants but understands they need to go through the proper channels. In the meantime, he said he wants to help in any way.